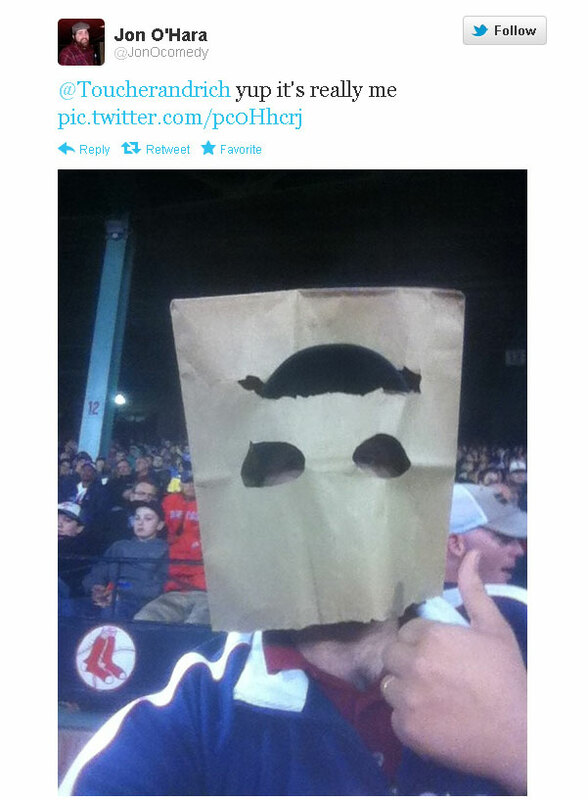 A Red Sox fan that wore a bag on his head during the early innings at Fenway Park during last night's Red Sox-Indians game created quite a stir on Twitter last night. Jon O'Hara, who spoke about wearing the bag on his head on 98.5 The Sports Hub's Toucher and Rich show this morning, was seated in the second row just to the left of home plate during the early innings of last night's game. "I don't recognize this Red Sox team so I don't want them to recognize me," O'Hara said during this morning's interview. O'Hara had to leave the section, that was in full view of NESN cameras, after the second inning when the people that had the tickets for those seats showed up. He said he continued to wear the bag when he took his seats in the loge section. While he was in the second row, O'Hara said one of the Fenway ushers approached him and said he may be asked to take the bag off, but no one had said anything yet. His disappearance after the early innings led to the creation of a hashtag -- #FreeTheBagGuy -- and the hashtag was trending in Boston by the fourth inning. Here's another picture of the O'Hara giving the thumbs up while Shin-Soo Choo stepped into the batter's box.